UNDER BIG BEN'S GAZE. It's the first time the Tour de France has started in England. And what a display it was through the streets of London today. 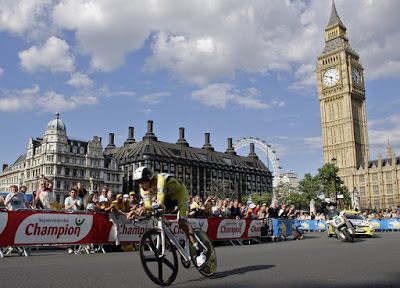 The world's best 189 cyclists sailed past Westminster Abbey, Big Ben and Buckingham Palace under sunny skies. CANCELLARA WINS THE PROLOGUE. The 8-kilometer time trial was won by Swiss Fabian Cancellara, the reigning world time trial champ. German Andreas Kloden placed second and American George Hincapie finished third for the day. SUNDAY JAUNT. The Tour remains in England for one more day. The cyclists will race south from London to Canterbury, traveling 200 kilometers over mildly rolling terrain. It promises a big-bunch sprint finish. On Monday, the Tour continues at Dunkirk on French soil. FOLLOW MY BLOG. I blogged a wrap-up of today's stage at The Tour de France for the Rest of Us. I hope to make daily entries throughout the 21 stages of the Tour. It's my annual July mania; sheer enthusiasm. I've also listed ways you can follow the Tour online if you don't have access to the Versus TV channel via cable or satellite.